An e-waste shredder is a machine used for reducing the size of all kinds of e-waste or named electronic waste, e-scrap, or waste electrical. E-waste shredders come in many different variations and sizes. Some examples of materials that are commonly shredded are: hard drives, computer, entertainment device electronics, mobile phones, television sets and refrigerators, etc. For data security and e-waste recycling, Zibo United Tech Machinery Co., Ltd. supplies kinds of quality e-waste shredder with low price. Zibo United Tech Machinery Co., Ldt. now offers different model e-waste shredder with different capacity to meet the growing need for destruction of hard drive. The e-waste shredder are also available for other electronic devices, such as cell phones, handheld devices, laptop computers… Shredding is the most effective and desirable solution for destructing confidential information, offering maximum protection and eliminating any possibility of reconstruction or retrieval. 1. There are several discs mounted on counter-rotating shafts. 2. Each of the discs is made of alloy steel or furnished with a tool steel head. 3. 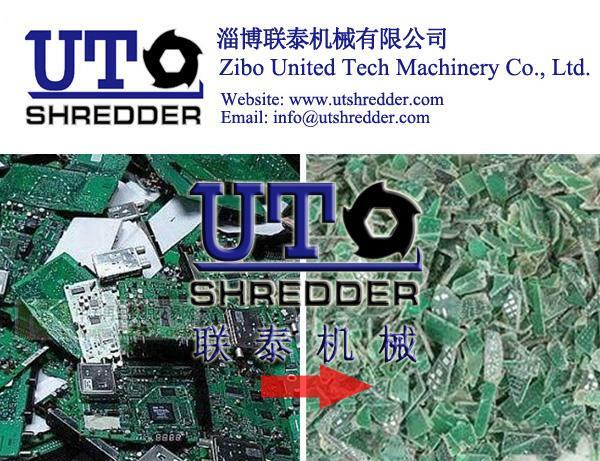 The discs can be replaced quickly thanks to the special shaft desig, operate the e-waste shredder easily. 4. The tool steel head is exchangeable quickly and without effort, which results in a significant reduction of tool changing times. 5. The spedific shape of the discs guarantees to crush material with little expenditure of energy, it makes this e-waste shredder to be durable. (1) Are you a trading company or a factory? A: We are the 100% manufacturer ,could guarantee the price is first-hand. we are good at design and produce shredder, crusher and granulator which wide in the solid waste recycling treatment business. (2) Where is your factory located? A: It is located in Zibo City, Shandong Province, China, which is very convenient for you to have a visit. Welcome. (3) How are your products? A: Material selection and hardness survey are critical for the sake of a quality knife and machine parts. We are firmly engaged in knife manufacturing, and had a good command of mechanics & property of different hot/cold die steels. Inspection on incoming materials is furthermore well taken care of. We have optical inspection equipment to improve the durability of our knives. We also developed long-term cooperation with domestic iron and steel factory, which helps us to have the more competitive, and more importantly quality materials We are serious manufacture, and all our knife parts must be mechanical hydraulic forging. For hardness, our knives are uniformly heat treated and triple tempered by vacuum furnace. Specific hardness range is set up for any specific working condition, thus giving better wear resistance ability and longer working life. And we will test it before shipping and send the test video to you. (4) What payment terms dose your company accept? A: Generally we accept L/C and T/T. 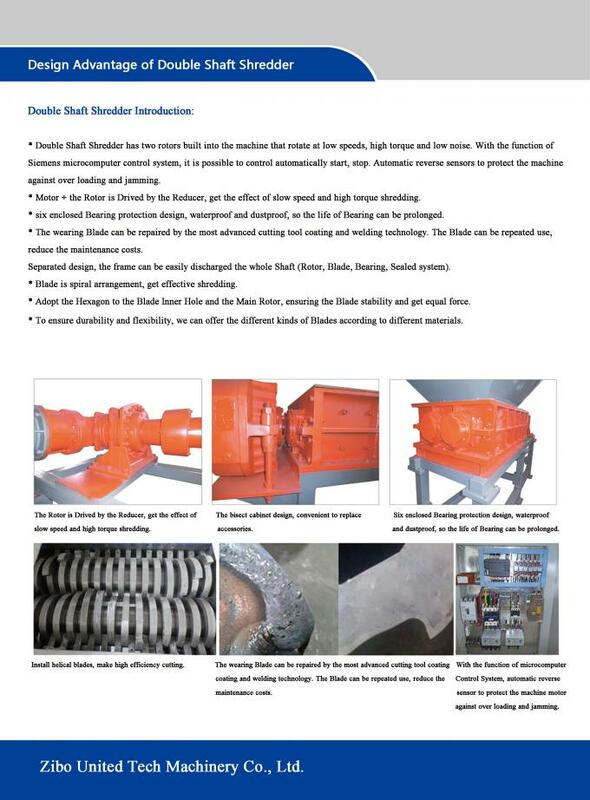 Double shaft shredder have been designed for a wide array of applications and industries, suitable for shredding solid material such as E-waste, metal, wood, plastic, scrap tires, packaging barrel. Pallets, etc. And particularly well suited to the size reduction of bulky or voluminous materials which could include contamination such as metals or stones. 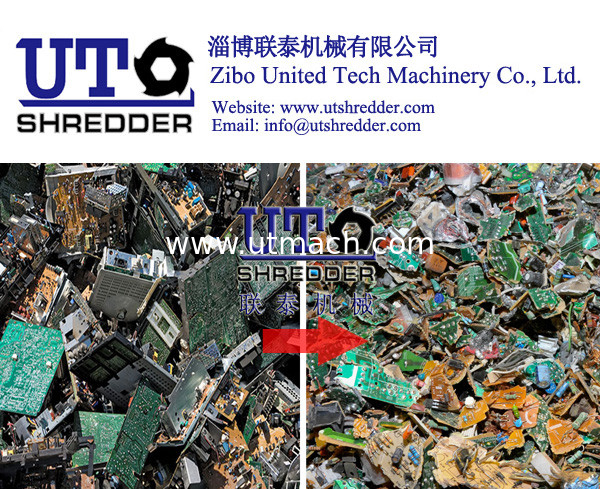 Depending on input material and the following process the shredded material can be used directly or go into the next step of size reduction. 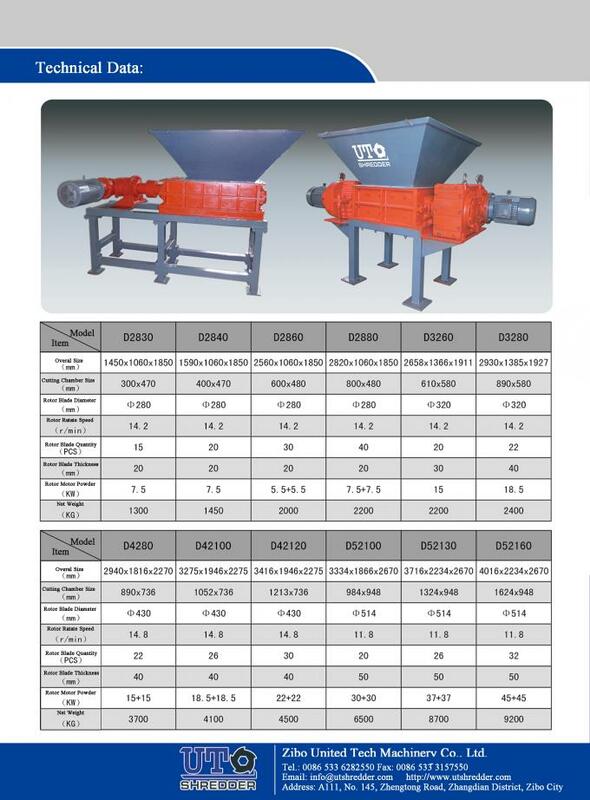 It can efficient to increase the bulk density and decrease the transportation cost. 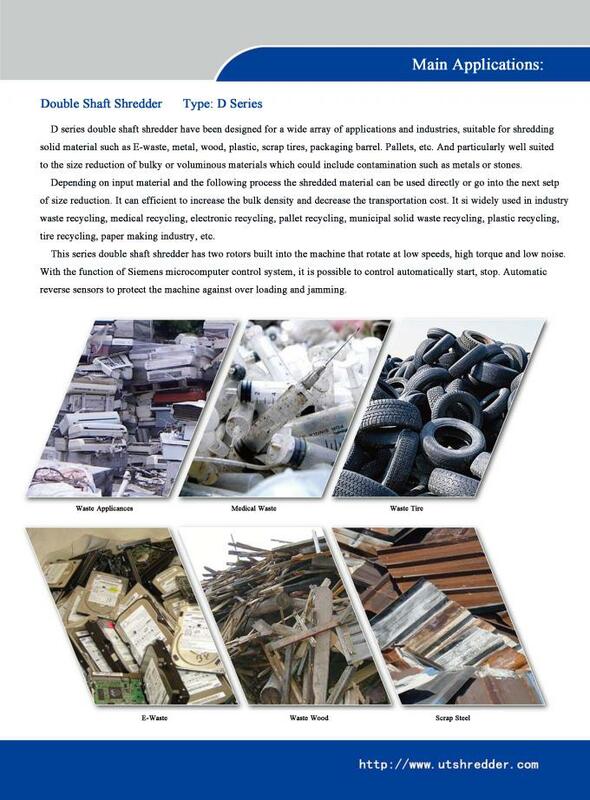 It is widely used in industry waste recycling, medical recycling, electronic recycling, pallet recycling, municipal solid waste recycling, plastic recycling, tire recycling, paper making industry, etc. 3, Old furniture, television, computer, wood, paper, cloth, leather, etc. 4, Steel, waste steel wire, color steel plate, paint buckets, cans, waste metal, etc. 5, Wood, waste wood pallet, plank, waste wood floor, wood packing case. 6, Waste cloth, fabric, carpet, medical waste, gauze, bandage etc. 1. Customize & OEM is available. 2. Consumable parts for free distribution. 3. Our engineer are available to service oversea. 2. usually wooden case or plywood package.